No one could predict that Mel Gibson would come out of the ashes of his very public scandal to once again be embraced by Hollywood, receiving a nomination for Best Director as well as the film in question being nominated for Best Picture. One would like to think that spouting angry misogynistic, anti-Semitic venom would bury an individual for a lot longer than it seems to have hindered Gibson’s career. But hey, I guess that’s Hollywood? Something about the whole situation doesn’t quite sit right, which is oddly fitting when you consider the film in question itself, as it is one that seems at odds with its own supposed ideals, resulting in perhaps the most grating Best Picture nomination of this awards season. 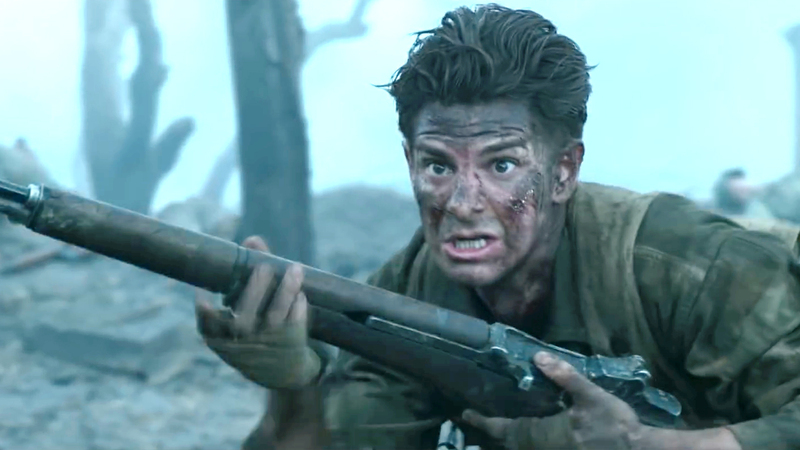 Desmond Doss (Andrew Garfield), a seventh-day Adventist, is desperate to serve for his country and his God on the front-line in the Second World War, despite refusing to ever take hold of a gun. Determined to serve as a medic in order to do his part, Doss is met with hostility and rejection as he fights to uphold his Christian values in the face of the United States Army. That is only the first battle he must face, as he and his unit are sent to Okinawa to take Hacksaw Ridge. There, Doss’ bravery is given a platform to shine as he embarks on a heroic feat that no one ever expected of him. Mel Gibson is a director who is undeniably skilled at his craft. He knows how to mount scenes of incredible complexity, with most of his directorial efforts offering moments of shocking violence and ballistic impact. That skill is present here in Hacksaw Ridge, but it simply seems far too much when it comes to the tale of Desmond Doss, the first conscientious objector to be awarded the medal of honour. For a film which claims to be anti-war it seems to be far too gleeful in its depiction of military action and triumph over the enemy to seem sophisticated in its depiction of this Pacific conflict. Doss’ story is undoubtedly interesting and should have provided fertile ground for a war-time tale that aims to have a more balanced depiction of the conflict, one which calls into question decisions by both ‘the good guys’ and the bad. There are shades of that but only really in the moments in which Doss must face aggression from his peers during training at Fort Jackson. Once we enter the shell-riddled cliff top of Hacksaw Ridge, Gibson seems to forget about his central figure all together, focusing more on the military operation than that of Doss’ actions on the field. Where we could have had a unique depiction of combat from the perspective of a man who is brave enough to run into battle without a single weapon to hand, we are instead given a very generic depiction of the unit attempting to press the frontline. It is full of impressive pyrotechnics and bombast but at the cost of abandoning the reason why we should be invested in the first place. 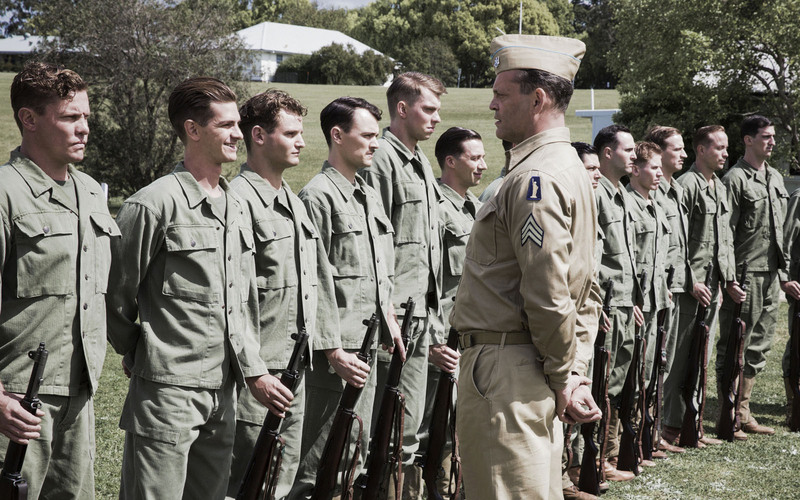 The conflict atop Hacksaw Ridge was undoubtedly devastating, but Gibson fails to truly grasp the dramatic potential that Doss’ story should offer. The scenes at Fort Jackson represent the film at its most thematically aware, with many of the scenes of Doss facing persecution from his supposed brothers-in-arms proving to be engaging, making better use of the dramatic potential that Doss’ story offers. What anchors Hacksaw Ridge and what makes it worthy of your time is Garfield’s performance. He has an easy-going charm and plays Doss with a steadfast confidence, appearing very dignified and noble throughout. Vince Vaughan also impresses as Doss’ Sergeant, turning in a rare dramatic performance that reminds you how good Vaughan can be in more serious fare. Hacksaw Ridge is a very contradictory film. It offers elements of an anti-war message, yet celebrates the results of violence in war. It is inept yet highly technically flawless. Silly yet highly dramatic. It is capable of being unflinchingly forward yet sickeningly sweet in a way only clichéd, award-baiting movies can be. It is a big old slice of apple pie, topped with a large chunk of cheddar that is then rudely served to you by an over-aggressive waiter. There is a captivating story in here, but the means in which Gibson has told it leaves you questioning many of the decisions made in the depiction of Doss’ undoubtedly powerful story.